Journalism That Matters supports the people who are shaping the news and information ecology so that journalism serves the needs of individuals and communities to be self-governing. Journalism That Matters is an evolving collaboration of individuals supporting the pioneers who are shaping the emerging news and information ecosystem. JTM focuses on cultivating “healthy journalists” and lively, informative interaction between journalists, educators, reformers, and community members. We support renewing the inner life of the journalist, and embrace all forms of media engagement with an eye towards preparing the next generation of journalists for co-creation with emerging citizen journalist. Since 2001, JTM has hosted 14 vibrant and catalytic “unconferences” that have inspired hundreds of widely varied media initiatives around the nation. 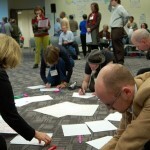 Using interactive conversation practices, including Open Space Technology, World Café, Appreciative Inquiry, and Dialogue, JTM events engage the potentials and creativity of the people who show up, inspiring breakthrough thinking and ongoing collaboration that effects positive change. JTM events encourage participants to address important questions facing the industry today. WHAT’s possible now? WHO are the new journalists? HOW are stories chosen? HOW are they told? WHAT kind of change is productive? WHO can the public trust? WHAT is the role of journalism in connecting people and community? WHERE can editors find qualified contributors and information with increasingly diminished budgets? WHAT new technological sources are reliable? WHERE is the new newsroom? WHEN are beat blogs, twittering and social networks best utilized? WHY is transparency so important? HOW do we maintain transparency and accountability while protecting sources? 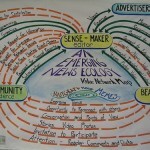 Who belongs to JTM and what is the new news ecology? 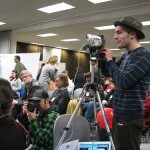 JTM members include reporters, bloggers, editors, citizen journalists, publishers, media educators, community activists, tweeters, videographers, social entrepreneurs, photographers, reformers and volunteer journalists from print, broadcast, and online media, both mainstream and entrepreneurial. Individually and collectively we are working hard to reinvent ourselves as well as the overall news medium, including investigating new economic models to support a healthy, vibrant journalism community. Shaping a new “cultural narrative” – Recovering the mythic role of journalists as conveners and navigators through a changing world prepares them to support communities in shaping a new national “master narrative” for our times. 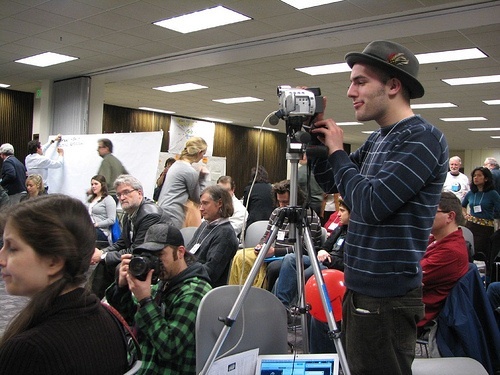 High tech/high touch journalism – Whether on the web or in the café, new storytelling forms are emerging that engage us on cell phones and iPods, and in gathering places with food, music and the arts. Ready, Fire, Aim – A strategy of “just do it,” moving from idea (ready) to implementation (fire) and then watching the results and adjusting (aim). This formula creates rapid experimentation and learning and avoids analysis paralysis. Expanding the questions we ask – Adding to the normal who, what, where, when, how, and why, asking questions like “What’s possible now?” expands stories beyond simple information gathering into the realms of inspiration and hope.